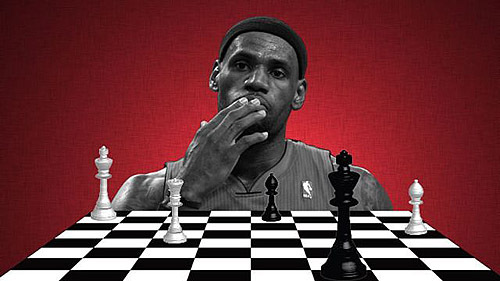 In an article published a couple weeks ago on grantland.com, a comparison was made about Lebron James being a chess Grandmaster on the court. Any knowledgeable sports fan will be able to see the connection instantly as basketball strategy is predicated on mismatches, angles and exploiting weaknesses when timing is important. James has tremendous physical gifts and a high basketball acumen and is reputed to be the world’s best player at this time. Of course, the chess metaphor is often stretched to suit many different subjects. What is the truth of this? Are there any connections between basketball and chess? Certainly. 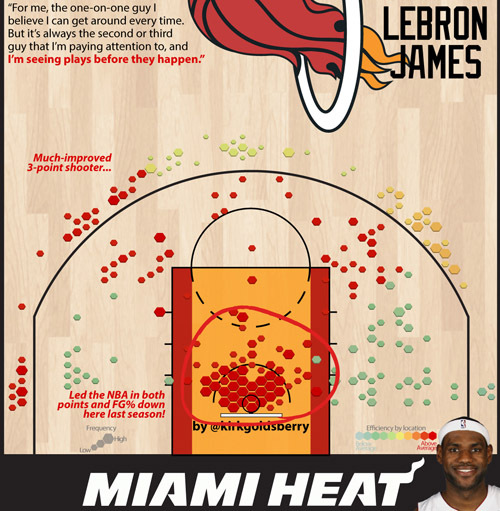 The article talks about the Miami Heat and how the offense flows fluidly through James’ foresight. They also profile Dwyane Wade, Chris Bosh and other weapons in the Miami Heat arsenal. They even compare James to former World Champion, Garry Kasparov. Perhaps there are some parallels between James and Kasparov since it is easy to compare two players at the top of their fields. Both have tenacity, killer instinct and a body of knowledge that is more refined than opponents. Here is a chart they include in the article. So James talks about seeing patterns develop and then end result before it unfolds. Ok… sound like chess a bit. There is no question that comparisons can be made, but there is another creative way to view this. We’ve shown this before and we’ll show this old classic once again. It’s ironic that almost all of these players are with different teams now… or retired! The article follows the video. NIce article again Daaim you on all cylinders now bro! lol Bron-Bron and Basketball another global game!!! LOL. I wonder how good a coach he would be. Cerebral players go on to be good coaches, unless their game depends on abilities that can’t be passed on to most students. I remember as a coach, Magic Johnson was frustrated by players’ inability to see the court the way he did.